If you ever had possibility to try baked fresh heart of palm you will understand that it is one of the true culinary delights! It is served as a first course accompanied by melted butter, salt and pepper, and honey. 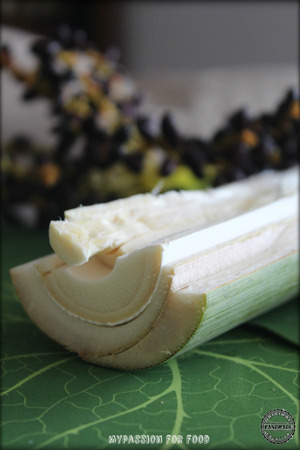 Fresh hearts of palm might be difficult to find in Europe, you can buy one in cans but they do not taste the same. Here in Brazil, Sao Paulo I can find them in the super market OBA. You can not miss it as it is normally 0,5 m long and light green. Melt the butter in a small saucepan. Set aside. Run a sharp paring knife down the length of the first layer of outer bark surrounding the palm heart. You will feel that the first layer is easy to remove with your fingers. The second layer is more tender. Leave it intact. Place the palm hearts in a baking pan and generously brush with the butter. Season with salt and pepper. Bake for 2 hours, or until they can be easily pierced with a paring knife. It should feel soft and buttery. Serve them with salt, pepper, and honey if you wish.